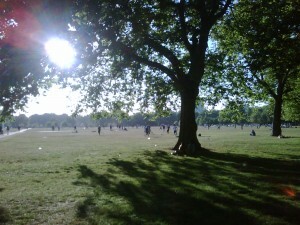 Hyde Park was packed with people, running, playing team sports and hanging around. It certainly was fun to run with so many people. Somehow I ran faster than normally, I guess to make a good impression :-). And it was hot, on top of that. Nonetheless, it was fun and I plan to run more and track(!) my future international routes.